• A companion website featuring a testbank of essay and multiple choice questions for instructors, as well as student study resources such as an interactive timeline, chapter summaries, annotated further readings, links to online resources, flashcards, and a glossary of key terms. 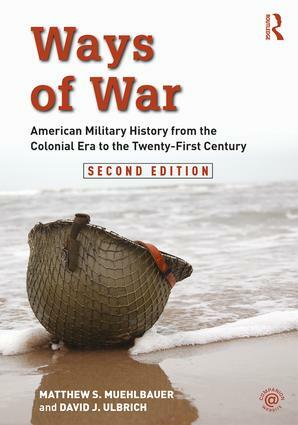 Extensively illustrated and written by experienced instructors, the second edition of Ways of War remains essential reading for all students of American Military History. "This readily accessible book offers a clear and up to date account of military history,one that is highly pertinent in these troubled times. The second edition is a good instance of how best to keep books relevant and clear. Strongly recommended." "This new edition brings the work up-to-date through an expanded introduction and the most recent events in international diplomacy and the Global War on Terror, probing into vital questions of national identity formation, technology, unofficial military tradition, and additional international context—from Queen Anne’s War to the effects of the Russo-Japanese war." "Authoritative and well written, WAYS OF WAR is a truly cutting edge survey of American military history. Packed with compelling narratives and crisp insights, this is not so much a traditional text book as a personal guided tour by two leading scholars through our military past. An excellent book and one that is certain to become a classic." "Matthew S. Muehlbauer and David J. Ulbrich have produced an admirable text built around Russell Weigley’s framework in his now classic American Way of War (…) Highly recommended for all audiences, not just college undergraduate and graduate students." "The sheer scope of the text is impressive, yet it does not descend overmuch into the weeds of battles and military trivia, instead remaining focused on how conflict involving Americans, and not just European Americans, has evolved over the years." Matthew S. Muehlbauer is currently an Assistant Professor of History at the United States Military Acdaemy. David J. Ulbrich is currently the Program Director of the Master of Arts in History and Military History degrees at Norwich University.